Class reunion season is getting close and its never too early to start planning your class reunion! Our alumni site has free online reunion tools where you can post your event, manage your own reunion page, schedule meetings, sell tickets online and even open a free class reunion merchandise store to raise funds for your event. Its up to each class to plan their own events and anybody can start the process on the website. Visit the site to start planning your reunion or search for upcoming class reunions. We are liquidating all our sweatshirts, hoodies and jackets at near cost to reduce our inventory before the winter season comes to an end. 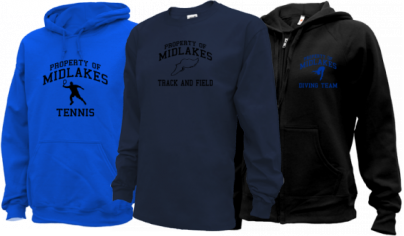 Its a great time to purchase your Midlakes Screaming Eagles gear at a huge discount. You must act now while supplies last! Be sure to visit the site and welcome our newest members! The site is growing quickly as more and more alumni register but we still need your help. Please invite any alumni you are in contact with to join the site. If you are on Facebook you can send a Facebook invite directly from the site! Raise Funds with a Free E-Store! Our apparel supplier offers free online stores for anybody and 20% of each sale goes back to your cause. This is a great year round fundraiser for any school, sports team, alumni association, business or non-profit. We highly recommend this fundraiser so take a few minutes and register for a free online fundraiser store! • Your Logo, Colors & Your Profits!